Seeing old friends who were traveling through town this weekend. Visiting with my Grandmother who's come to stay with us for the week. The new arrangement of my studio. Love having everything within reach! P.S. I'm going to pause the linky party right now. But if you have a post you'd like to share please leave a link in the comments below; I'd love to see it! I like your picture sounds so yummy!! Just the words "pumpkin spice" make me breathe in the chilly air of autumn. Oh how I love autumn *happy sigh*. I can't get my mind off The Lion King. But now maybe pumpkin is in the mix too. Have fun visiting your grandmother! I completely understand; I've seen it and it's astounding! Aww no more linky party? Bummer! It's ok though--I understand, since I was the only one cool enough to link up every week ; ] My current latest blog post was supposed to be linked up. You can check it out if you get the chance, but no worries if you don't! Catherine, I wanted to join your link up but could never seem to do it on that day. I don't usually post on the weekends, and it was too much planning ahead for me! It's feeling very fall around here. I made my first soup of the season, Zuppa Toscana ala Olive Garden. Oh I completely understand, Bridget. I don't want anyone feeling pressured. Our weather is getting there but not cool enough yet for my taste. However, that soup sounds amazing! I 'm loving colder weather, fairy tales, new earrings, jewellery making and my new love, Pinterest! 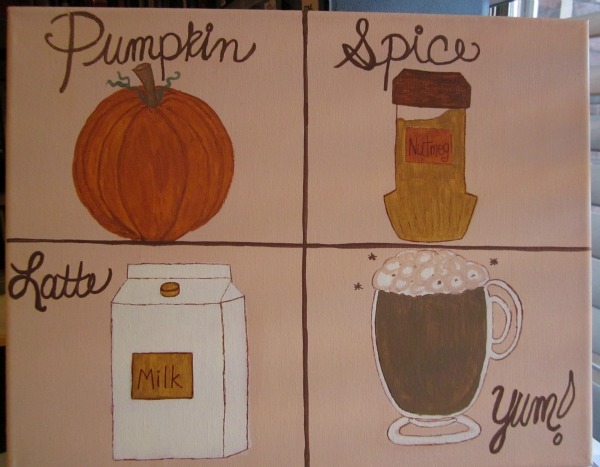 As for pumpkin spice latte I haven't tried it yet but I really want to!